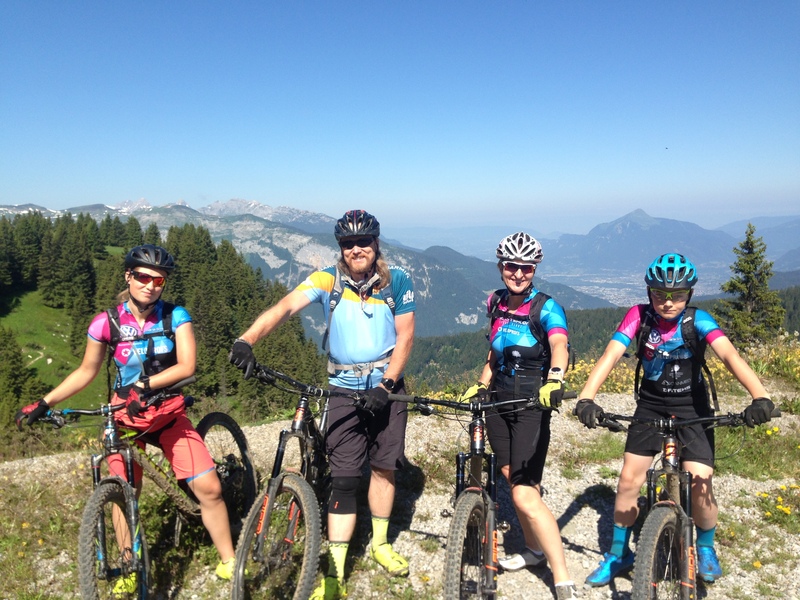 Another Ride the Alps mountain biking season has drawn to a close in style. 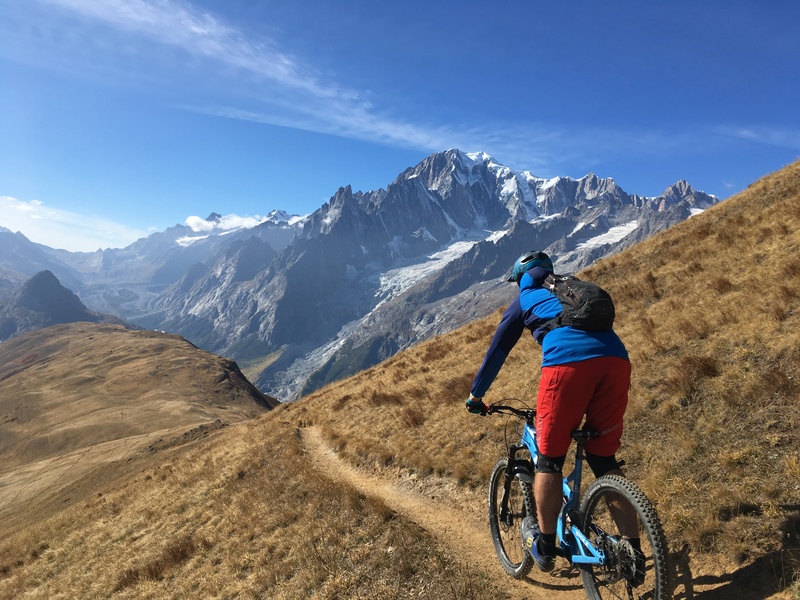 The good weather has finally turned in the French Alps and the seemingly never ending blue sky days and bone dry trails are no more. Both Jamie and I have been getting up above the 2000m level these past few weeks before snow stopped play. 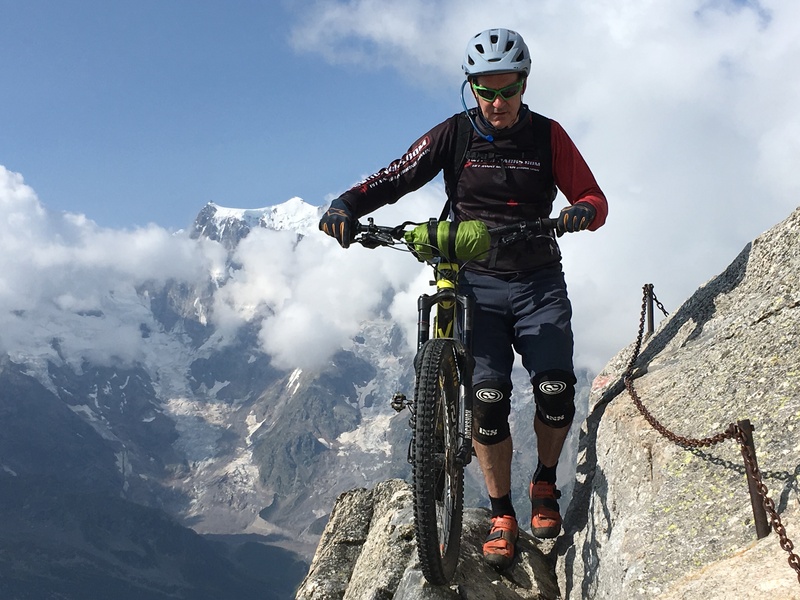 Jamie had a grand day out on the Italian side of Mont Blanc the week before last with a high level ride above Val Ferret down into Courmayeur that he’s never done before. He said it was one of his best days on the bike this season. Huge views and fantastic singletrack. 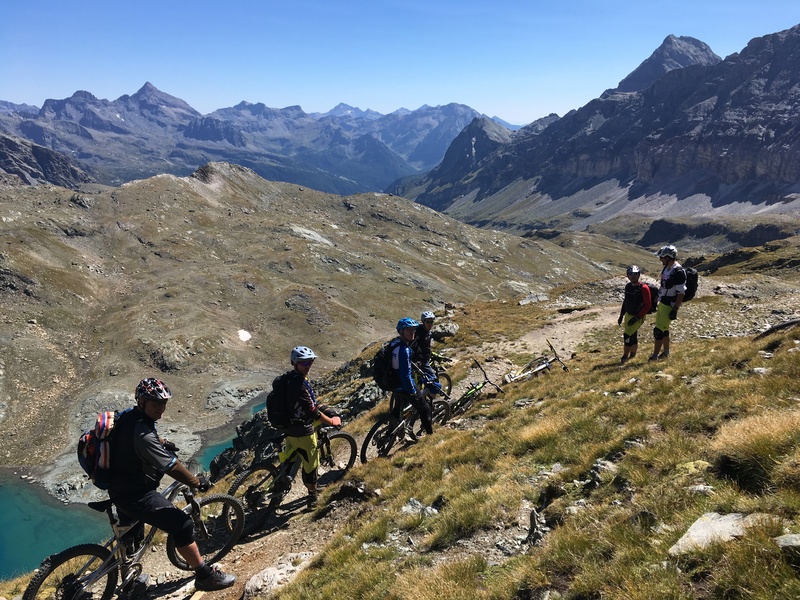 It’s definitely worth bearing in mind that if you don’t mind peddling uphill the Alpine biking season doesn’t end with the lift closures at the beginning of September. Year after year we get warm, dry and sunny weather right through to the back end of October. The Ride the Alps mountain biking season doesn’t close until the cold rainy season begins, which is usually not until November. Then we only have a month or two to wait until the snow comes and we can break out the fat bikes. I had a chat with Jamie about his thoughts on the 2018 season and what’s to come in 2019. What were your top 3 single best days of riding this summer? Day 3 of the 2nd Chamonix to Zermatt trip of the season: Evolene to Grimentz. 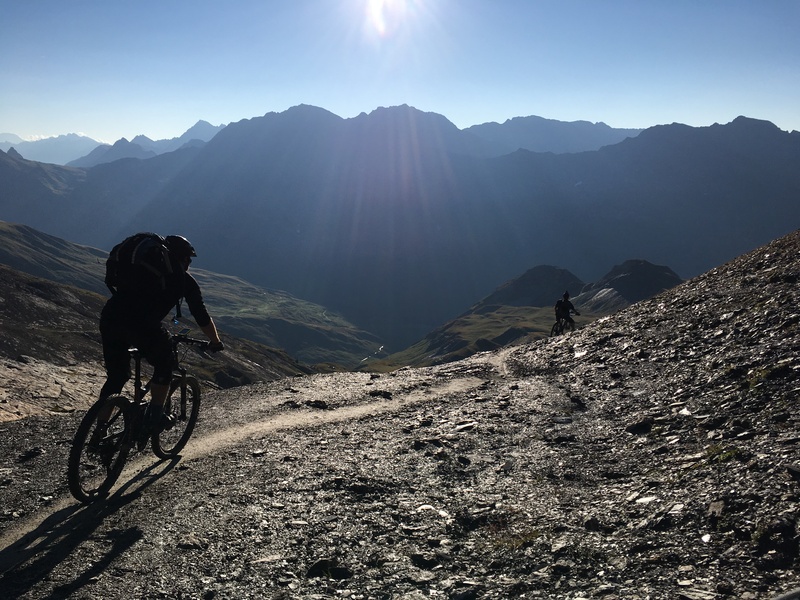 We rode the super technical trail directly down into Grimentz from the Pas de Lona – 1300m descent. I hardly ever get to ride this route because of its difficulty level. This trip was the first time I’ve ridden it on my enduro bike and I absolutely loved it! Day 2 of the 1st Monte Rosa trip of the season: Gandegg Hutte to Refuge Ferraro. 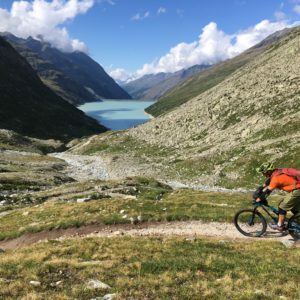 This day had every kind of riding possible – high level fast descending, a glacier crossing, bike-a-hike, bike park burms and jumps, technical singletrack on natural trails, the crossing of a high alpine pass and all against the backdrop of the most amazing views imaginable. Day 2 of the last TMB of the season. We rode the high ridge above the Bonhomme Refuge. Beautiful late afternoon sunlight; the golden hour. Narrow flowing singletrack on a very high ridge. Endless views. Exposed trail to sharpen the senses. A perfect moment! 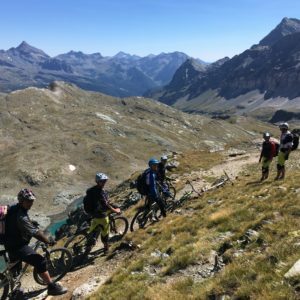 What was your favourite Ride the Alps trip of the summer? The new Tour of Monte Rosa. This summer we ran two pilot trips and I tried slightly different routes with each trip in order to perfect the route. 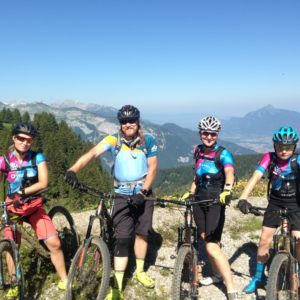 This is a truly adventurous mountain biking trip that has everything: pioneering riding, high level riding, sustained technical singletrack, breathtaking views, varied and charming accommodation. It’s a self-supported trip so you get a great sense of achievement when you complete the circuit. Did you ride any trails that are new to you this summer? Loads! The aforementioned ridgeline on the TMB. Lots on the Monte Rosa to try to perfect the route. Every trip we run I endeavour to try a new trail, even if it’s just a small section. I’m always looking to find new routes and improve our tours. 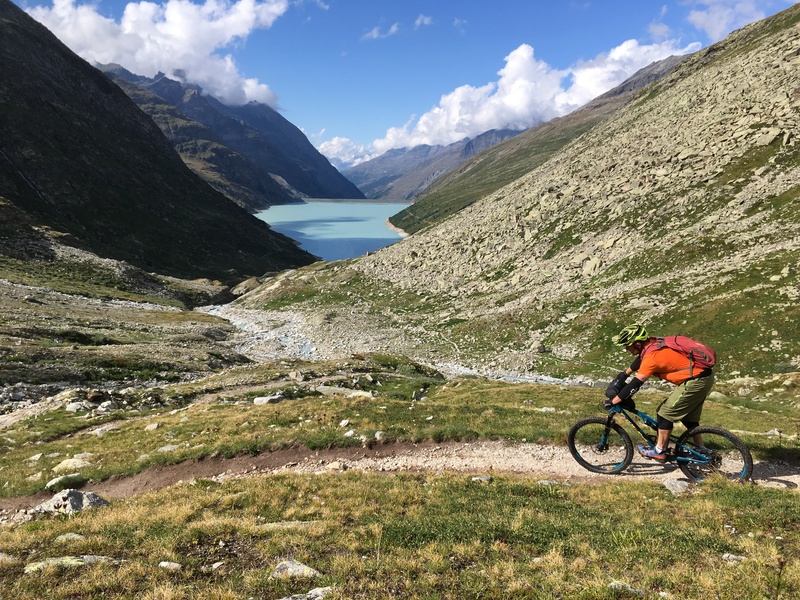 The ride above Val Ferret into Courmayeur that I did this autumn mentioned at the start of this post. This route simply isn’t possible during the TMB season. There are way too many hikers but it’s perfect in the autumn. The trails are quiet and you have the singletrack all to yourself! Do you enjoy guiding centre-based family trips as much as the point-to-point routes? They are very different kinds of trips. This year we had a great family from Latvia: Mum and Dad and 2 teenagers. Everyone was really up for the trip and improving and perfecting their skills. There were no complaints on the big 1000m climbs. There was a great vibe and everyone was so happy to be there. You can add more adventure into these centre-based trips depending on the groups you get. With the Latvian family we had an overnight in the Refuge de Bostan. 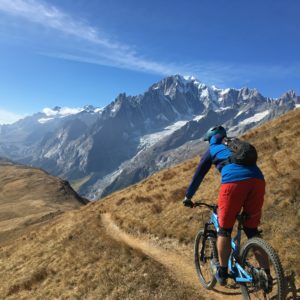 I revisted some old favourite trails in our valley and Chamonix during the last AST trip of the season. In particular the ride with Mary up and over the Col d’Anterne. We are very lucky to have amazing adventurous trails right on our doorstep. But of course, I also love the adventure and excitement of the point-to-point tours. 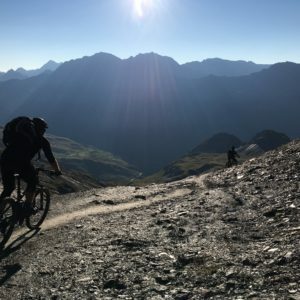 Are there any Ride the Alps trips you would improve for next season? I am always looking to improve by trying out new trails each trip. Some are really exciting finds and others confirm that the original trails are the best. 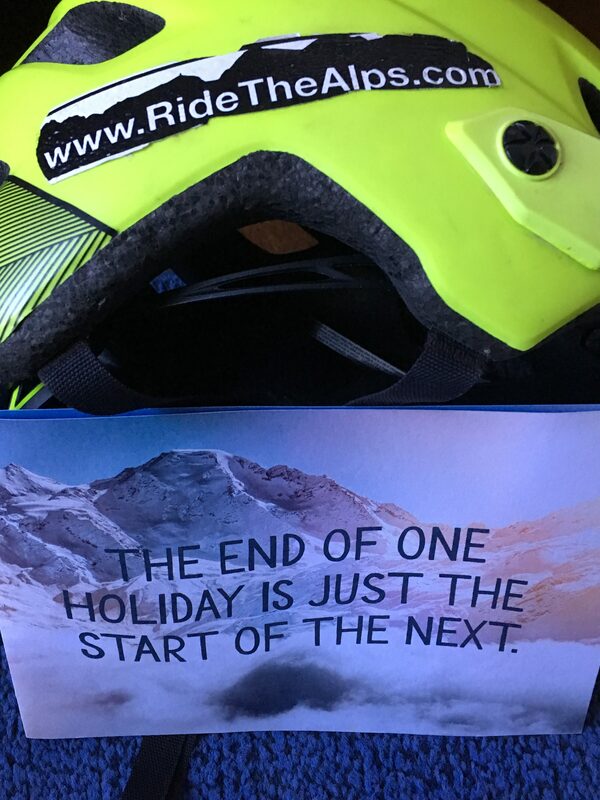 What are you looking forward to riding this winter? 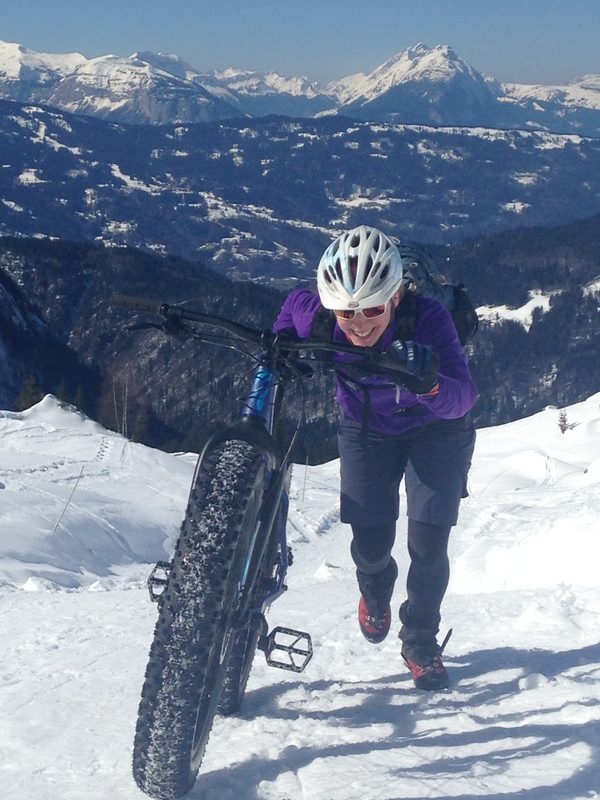 It’s great that we have the fat bikes now to keep the peddling going through the winter months. 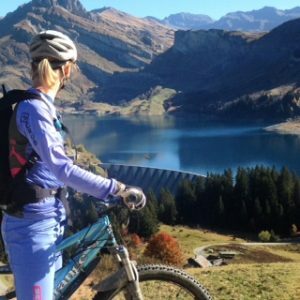 I’m hoping for a pre-Christmas trip with Mary to Goms in the Swiss Valais where they have a network of fat biking trails. It’s always a great morning out riding up to the Refuge de Bostan, one of the only refuges that opens in the winter. 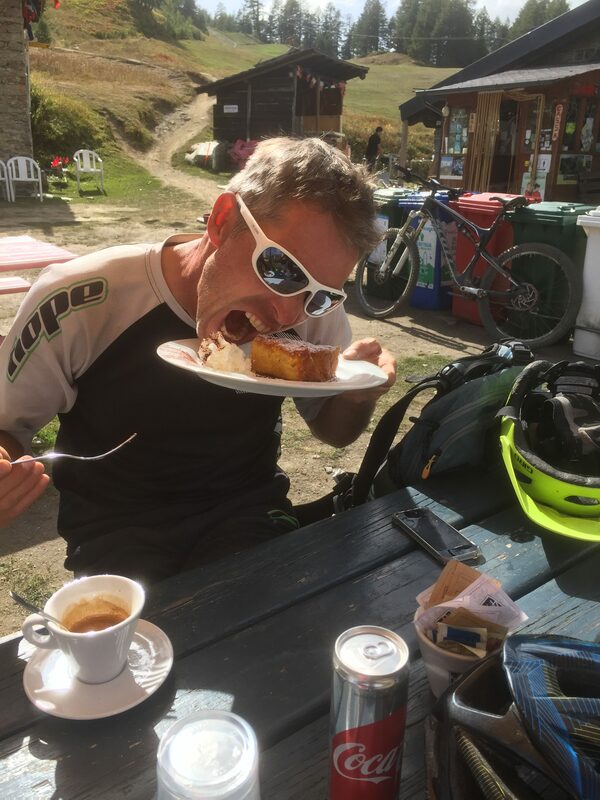 It’s tough on the legs and lungs but we take a break at the refuge for a coffee and patisserie before a great fun blasting back down on a mixture of compacted trail and off-piste. 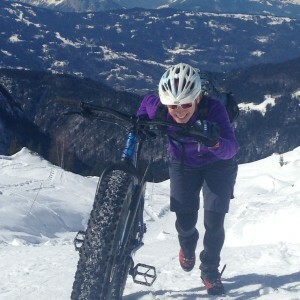 If time and money allowed I’d love to take the fat bikes to Swedish Lapland and for some beach riding in Scotland. Probably not this year but one of these winter seasons we’ll do it. How do stay bike fit through the winter months? Riding the fatties. Monster ski tours. Ski touring is a different action to peddling but it keeps the legs strong and the lungs in good working order. 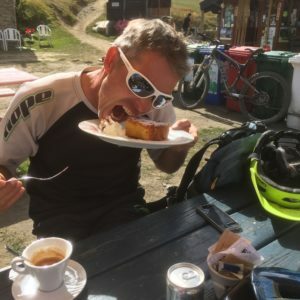 Last year I was training for the Radon Epic Enduro, which was at the beginning of April. I hauled myself back onto the turbo trainer for the first time in years for some intensive interval sessions. I’m going to enter the race again next year so I’ll be doing the same this winter. Have you got any new trips planned for 2019? The Tour of Monte Rosa is on general release after this year’s pilot trips. 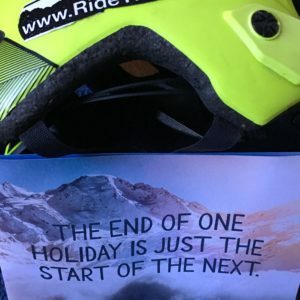 We will continue our recce of Chamonix to Briancon, which will hopefully be ready for the 2020 season. What are you most excited about riding next season? All the trips! 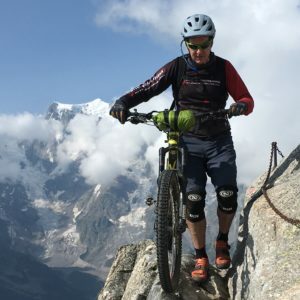 We have an Eiger trip booked in already and I didn’t get to ride that route this year so it will be great to revisit some of those trails. The classic C2Z has been my favourite trip for many years put it’s now being pushed hard by the Monte Rosa. I’d like to ride the TMB on the last week of the season, right at the very end of September when all the hikers are off the trails and it’s quiet and you can really let the riding flow. If anyone wants to book that week, let Mary know!